Nebraska’s corn ethanol industry will produce some 2.4 million metric tons of distillers grains like these this year. Distillers grains and other corn co-products are great feed ingredients for livestock and poultry. Corn co-products like distillers grains and corn gluten are outstanding feed ingredients for livestock and poultry – and thanks to the ethanol industry, which produces most of these products, they are readily available. To help livestock producers take advantage of these products, particularly distillers grains, which is more plentiful, the Nebraska Corn Board has sponsored a significant amount of research and educational efforts. This and other research demonstrated – and livestock producers verified – that distillers grains is an excellent feed ingredient. This is especially true for cattle operations, which can take wet distillers grains directly from an ethanol plant and feed them to finishing cattle at 50 percent or more of the ration (dry matter basis). This wet product saves the ethanol plant drying costs and is simply an outstanding value-added feed ingredient for cattle. In fact, cattle love to eat it and grow well on it – helping to reduce the overall cost of gain and giving Nebraska cattle producers a leg up on the competition. Most feed provided to hogs includes DDGs. Of course, beef cattle aren’t the only animals that perform well on distillers grains. Dairy cattle, swine and poultry can all consume differing levels of the high-protein product. 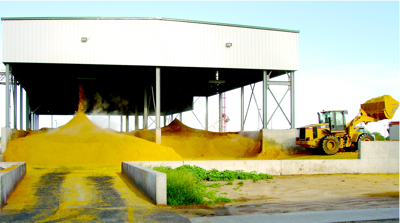 In addition, new technology will allow ethanol plants to produce several different feed products by changing how they process the corn. This may increase the value and feeding levels of ethanol co-products for many species. The Nebraska Corn Board has also sponsored research that focuses on the co-products of the corn wet milling industry, particularly corn gluten feed and corn gluten meal. 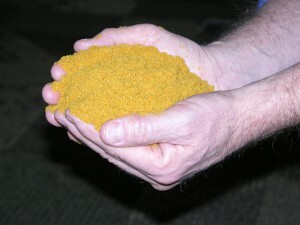 Like with distillers grains, corn gluten is a great feed product for cattle and other animals. The goal through all of these efforts is to increase the utilization of ethanol co-products by the livestock industry, but especially the livestock industry in Nebraska. The combination of corn-ethanol-distillers grains-livestock puts the state in truly a unique and advantageous position because no other state in the country can combine the three as well as Nebraska. Much of the Corn Board’s sponsored research has been conducted through the University of Nebraska, which also has an active role in educating livestock producers and animal nutritionists as to how best to feed ethanol co-products like distillers grains and corn gluten. In fact, the University of Nebraska–Lincoln (UNL) is one of the country’s premier research centers for beef cattle nutrition. Nebraska has more than 5,000 feedyards willing to work with cow-calf producers interested in retaining ownership or partnering on their feeder cattle and offering competitive feeding rations from the quality feedstuffs we have available. And now, cow-calf producers nationwide can get an up-close view of the cattle feeding industry in Nebraska, thanks to the six minute video, “Consider the Possibilities — Cattle, Corn and Co-Products — Feeding Cattle in Nebraska”. The video, produced by the Nebraska Department of Agriculture and sponsored by the Nebraska Corn Board, highlights the many opportunities available for feeding cattle in Nebraska. It also features University of Nebraska Extension beef specialists discussing the economic benefits of feeding distillers grains, risk management decisions and the parameters cow/calf producers can utilize to evaluate and select a feedyard. Video below. Dairy cattle like these can benefit by including corn co-products in their balanced feed ration. Corn co-products like distillers grains and corn gluten can also lower feed costs. A special section of the UNL Beef Cattle Production web site. Features a spreadsheet model called Cattle CODE, which allows cattle producers to insert their own data to determine if co-products are a wise economic choice for their operation. Manuals produced by the Nebraska Corn Board and University of Nebraska-Lincoln that summarize the latest research on the feeding of distillers grains and corn gluten to livestock, as well as provide details on how to store wet corn co-products like wet distillers grains. A listing of Nebraska companies who trade and merchandising co-products. A listing of Nebraska companies who are manufacturing and/or supplying distillers grains and corn gluten in pellet, cube or block form. 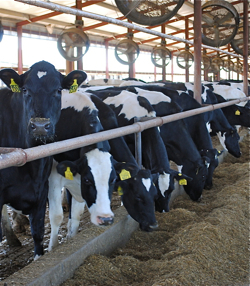 A report from the American Feed Industry Association. An introductory source of information on distillers grains feeding recommendations for beef, dairy, swine and poultry from the National Corn Growers Association. An organization providing educational and technical services to member producers and users of distillers grains. A “one stop” place to find the most current information related to using distillers grains co-products in dairy, beef, swine and poultry feeds.